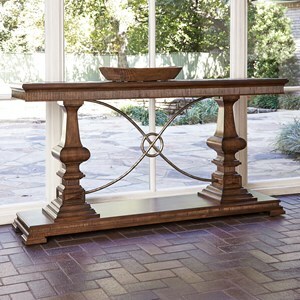 Beautiful detailing and elegant curved metal accents define the traditional style of this console table. A nutmeg finish over oak veneers and mindi solids provides a light look while the open design of the piece will help your space to look and feel bigger. The tabletop features a unique textured surface to provide the sofa table with a unique personality. 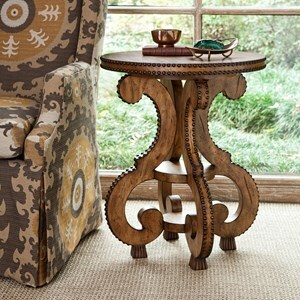 Scrolled legs flow into the perfect chairside tabletop in this beautiful industrial style end table. Adorning the traditionally shaped piece are metal studs as well as a weathered pine finish to add a vintage flair to the piece. Ambella Home Collection was founded by George Moussa. The son of an importer, George had his father as a business and importing mentor from an early age, and over the years, has created his own passion for the business. Each Ambella Home Collection piece is uniquely designed for the line and manufactured overseas. The production is meticulously managed so that a beautiful piece is the final result every time - from the production sample shown at market to a reorder one year later. Overseeing the selection of the best raw materials, using skilled carvers and craftsmen, artistic finishers and packing the piece so it arrives without damage are just a few ways we know that we can stand behind the quality of our furniture. We pride ourselves on selecting the best materials for each piece in order to ensure that it will withstand the test of time. For each item, we carefully select the wood, marble, granite, stone, iron, metal, glass, mirror, fabric or hardware, then hand-craft each design using the best techniques and finishes. Quality materials, combined with quality construction, result in craftsmanship that you will enjoy for a lifetime. Ambella Home was actually the first company to design and introduce the “Sink Chest”, a traditional wooden chest with a sink mounted to the top and plumbed for a faucet fixture. The sample was a huge success at market and has since become a category shown by many other furniture makers. Ambella Home Collection continues to be an innovator in not only the Sink Chest category but also furniture pieces for every room of your home. Ambella Home Collection is also very proud of our employees. We are very fortunate and thankful to have people who care about our company and have a passion for our products. With a knowledgeable customer service team, professional showroom personnel, creative designers, meticulous manufacturers, organized and intelligent office departments, detailed shipping and warehouse crews and innovative senior managers, each and every person plays a key role in ensuring that we deliver not only a quality product to our clients, but also an outstanding experience in working with us.